We all have memories of that horrible day. I don’t believe there is anyone who experienced that day – the tragedy of the attacks on the World Trade Center and the Pentagon and the loss of Flight 93 – who could not tell you exactly where they were and what they were doing. I was teaching school – third grade at the time – and I had just taken my students to music class. As I passed by the Guidance Office, the television was on which I though was odd. I stuck my head in the door, thinking that it might have been a local news story of some importance. What I saw will be forever imprinted upon my memory. The first tower of the World Trade Center was on fire…I just could not get my mind to process what my eyes were seeing. And then, the unthinkable… another plane flies into the second tower. Parents began arriving to collect their chidren from school – nothing would ever quite be the same. It was not just the innocence of my students that was affected, but the innocence of our country. What can we do to pay our respects to the victims and heroes of September 11th? Our country has established three memorials dedicated to preserving the memory of those who lost their lives that terrible day. A visit to any one, or all, of them offer an opportunity for reflection, discussion, and remembrance. Memorial – Daily, 7:30 a.m. – 9 p.m.
7:30 a.m. – 9 p.m.
Daily, 9 a.m. – 8 p.m.
*Last entry at 6 p.m.
*Last entry at 7 p.m.
*Children under the age of 6 are free. Admission is free for all visitors on Tuesday evenings from 5 p.m. to close, with the last entry at 7 p.m. A limited number of tickets are available for online reservation two weeks in advance of each Tuesday evening starting at 9 a.m. Same day tickets are available on a first-come, first-served basis at the ticket windows starting at 4:30 p.m. For tickets, please click here. Bronze panels with the names of every person who died in the 2001 and 1993 attacks, nearly 3,000 in total. The Pentagon Memorial, Washington D.C. The granite zero line marks the entrance to the Memorial. The date and time of the attack, “SEPTEMBER 11, 2001 9:37 A.M.” is etched in this line. 184 Memorial Units serve as a permanent tribute to each victim. 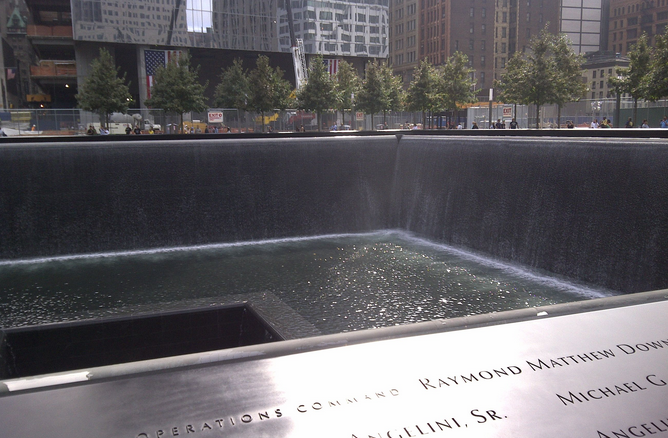 The Memorial Units are composed of a cantilevered bench, a lighted pool of flowing water, and a name plate. Each is intentionally positioned to help distinguish the victims who were in the Pentagon from the passengers aboard American Airlines Flight 77. The Age Wall borders the western side of the memorial and serves as a timeline of the victims’ ages, spanning from the youngest victim, three-year-old Dana Falkenberg, who was on board American Airlines Flight 77, to the oldest, John D. Yamnicky, 71, a Navy veteran, also aboard Flight 77 that morning. The Pentagon Memorial is open 24 hours a day, Monday – Sunday. Restrooms: Open daily from 7:00am – 10:00pm. Construction is ongoing and major progress continues on various features including the Visitor Center Complex, the 40 Memorial Groves, and the reforestation effort. 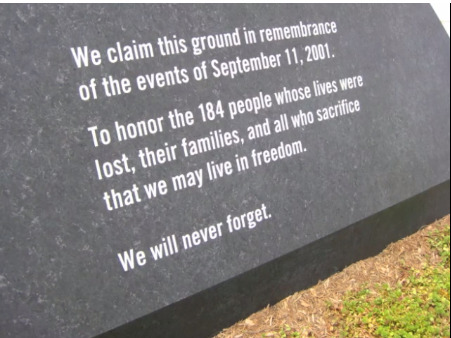 Fee: There is no entrance fee for Flight 93 National Memorial. Last entry: 6:30 p.m. – Gate closes for entry. Memorial Plaza Wall lies at the northern edge of the larger crash site. Benches are available near the wall for reflection. The field and woods beyond is the final resting place of the passengers and crew. A cell phone tour is available for visitors (see website). The Wall of Names consists of forty inscribed white marble panels which honor the passengers and crew. 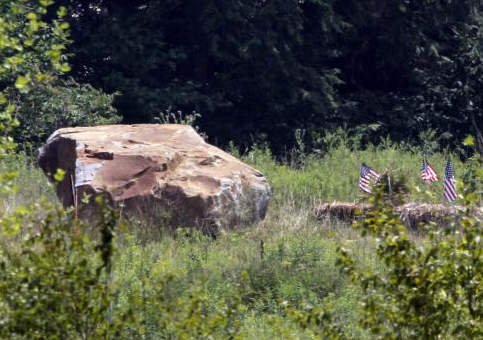 A large boulder marks the general location of impact at the edge of a hemlock forest. 2 Comments on "A Guide to the September 11th Memorials"
Reflecting on all the memorials to 9/11 & how we can honor those fallen is a great reminder to be given this day.